This report covers conditions and observations made between Friday, February 20 and Sunday, February 22, 2015. 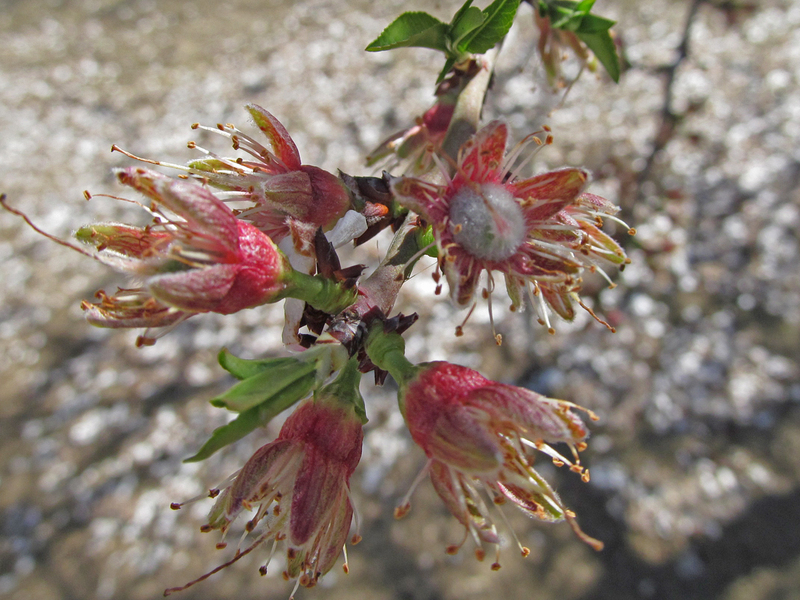 Taken in the Williams area, the first photo in today’s report shows nutlet development in the Monterey variety. 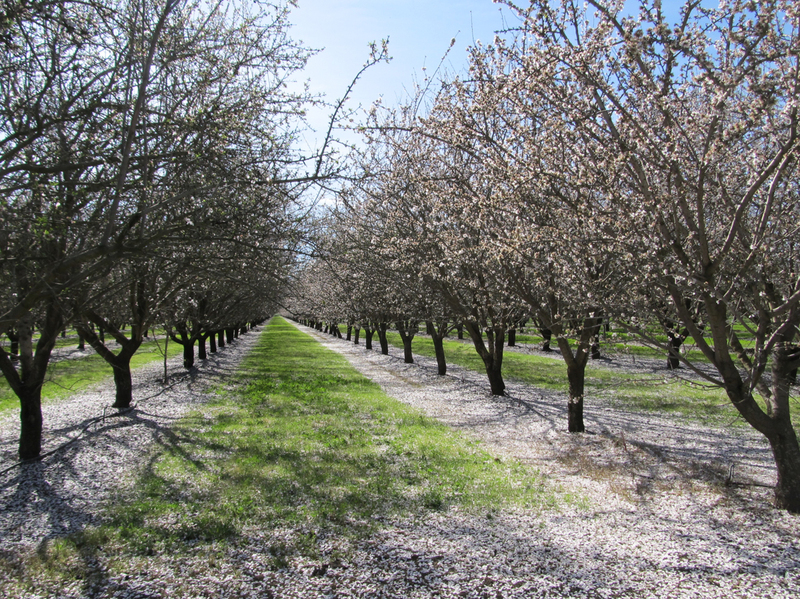 The following photos provide down-the-row views of the petal fall and later stages of bloom development in a Nonpareil and Carmel orchard, and a Nonpareil and Aldrich orchard, both in the Chico area. The northern region received a wide variety of weather over the weekend, ranging from foggy mornings to bright, full sun and strong, blustery winds. Morning low temperatures during the period were fairly consistent, ranging from the upper 40s to lower 50s. Meanwhile, daily maximums reached their greatest value on Friday afternoon after the widespread morning fog burned off, reaching into the low to mid 60s. Maximum temperatures then dropped back into the mid and upper 50s on Saturday and Sunday afternoon. Greatest bee activity of the period was reported on Friday and Saturday, with five to seven hours of good activity reported in most regions. 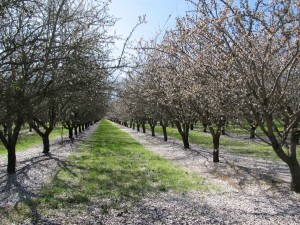 However, Sunday’s blustery winds, which approached 40 mph precluded much activity in the orchards, holding flight time to one to two hours of poor activity prior to the launch of the winds. 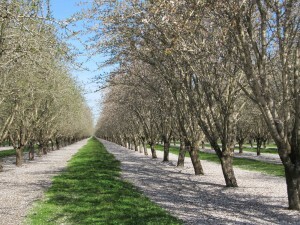 High winds on Sunday caused trees to shed petals at a quicker pace rapidly accelerating the second half of bloom. 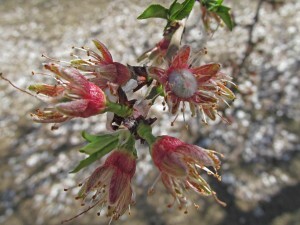 Sonora, Peerless, Monterey and all California type varieties have no viable flowers left available for pollination after the high winds blew them off, while less than one-third of their petals remain on the tree. Very few Nonpareil flowers remain available for pollination in the southwest part of the region and none remain in the northern area. The Williams area has close to one-third of its Carmel flowers available for pollination, while the Chico area has very few open flowers left. Butte and Padre bloom in the whole region is winding down. In the northern area there are less than one-quarter of flowers available for pollination, while in the southwest area there are just over one-third of the flowers available. Though there are still a few viable flowers remaining for pollination most varieties have lost upwards of 70% of their petals due to the high winds. Wind: 15 mph. Gusts up to 35 mph.